"The Toad Who Told Lies"
The first thing I ever wrote was a story called, "The Toad Who Told Lies," in a a second class at the Lakenheath Air Force Base Elementary School in the U.K. I was six years old. I started at Lakenheath in the middle of first grade, just after the Thanksgiving break. We flew out on the Friday after Thanksgiving, which was also my sixth birthday. Because it was my birthday, I got to visit the cockpit and got a little Pan Am Honorary Flight Crew kit, which included a little pin with wings that I treasured. I've had some lovely birthdays since then, but nothing has topped it. My happiness was short lived. On my first day, the other kids were making thumbrints with a red stamp pad and turning them into ladybugs with black pens. I thought that looked like fun, but I couldn't do it—I had work to catch up on so I could fall into lockstep with the others. I threw a tantrum, and it was all over between me and Mrs. Tucker. The rest of first grade is a blur of sprayed glue bottles and thrown lunch boxes, the tassles cut off of reading room pillows, the pages ripped out of spelling workbooks. I was a problem child. My parents visited the principal several times. When summer came, I am sure Mrs. Tucker breathed a huge sigh of relief. In second grade I was assigned to Mrs. Round, who was, in fact, rather round, which made her name easy for kids to remember. Mrs. Round was a merry person, who enjoyed books and food and children with ucompromised zeal. I remember well how delighted she was by every kid in the class. It was a good year for me. I don't remember ever being in trouble, and I had a lot of happy chats with Mrs. Round about books. One of our first tasks was to write and illustrate our own books. Already an avid reader, I was stunned by the idea that I could make my own book. And hence, "The Toad Who Told Lies," was born. I was so pleased with the results that I wanted to read it to everybody. Mrs. Round herself thought it was so wonderful she sent a note home to my parents to the effect that Kurt had a talent for writing and drawing, and they should encourage it (which they did, my whole life). I decided that writing and drawing were what I loved to do, and wanted to do, but drawing has been a much more on-again off-again pleasure while writing has been my constant, anxious, compulsion. Unfortunately, the original manuscript of "The Toad Who Told Lies," (which my mother insists was entitled, "The Tode Who Tode Lies," and she may be right) was lost in a flood that ravaged Grand Forks, North Dakota in 1997. Even then, I hadn't seen it for decades. It had been sent to my grandmother and made its way back to us after she passed away, set aside by my mother for my next trip home, and then came the mighty Red River to take out half the town. It occurred to me that you can not always recover what was lost, but you can re-create it. I barely remember the original "Toad" story, but I do remember a few key scenes -- the lies Toad told, the comeuppance exacted upon him by his friends. So here it is, re-imagined: the story that changed my life, thanks to a teacher who turned a problem child into a happy, creative kid just by treating him like a happy, creative kid instead of a problem. 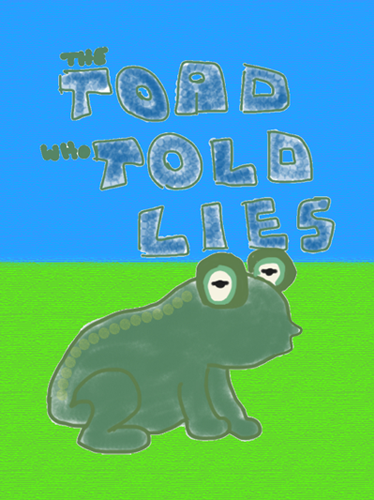 Read "The Toad Who Told Lies."